You all knew it was coming – Toast! There’s no way he could be left out of our gallery of memorable guest performers. No. way. We first meet Toast in episode 1.2 Ohana (Family) when the team is searching for a kidnapped NSA computer specialist. They ask for Toast’s help – he’s a master hacker, previously known to Danny, and somewhat of a pothead (who gets paid in lollipops!). And he’s hilarious. It is only a brief scene in 1.2 but I think it’s safe to say that Toast left a lasting impression on the audience. So no more Toast until season 3. Boo. But his reappearance is awesome. He’s gone from Ohana (Family) to Ohuna (Secret) and even in a jam-packed episode (already featured on The Champ Box in our Morty post), his performance is memorable. I get that Toast is there for comedic relief but I thought his part in the episode was relevant to the COTW and the writers avoided over-doing it while still making it memorable. And it was funny. Toast’s services are called upon yet again as the Five Ohs are on the trail of a cyber criminal suspected in the kidnapping and murder of Zach Slater, a teenage computer whiz just released from juvie for some pretty serious hacking. They find Toast in his computer shop telling a customer to “think before you link.” Hehe. Then McG and Danny break the news to Toast that they need to use him as bait to flush out the suspect, Kong Liang. Toast is understandably unhappy about this and says he won’t do a thing until he has ‘total impunity’. Impunity? Hilarious. McG and Danny are on the same page here, collectively rolling their eyes at Toast’s reluctance to get involved. 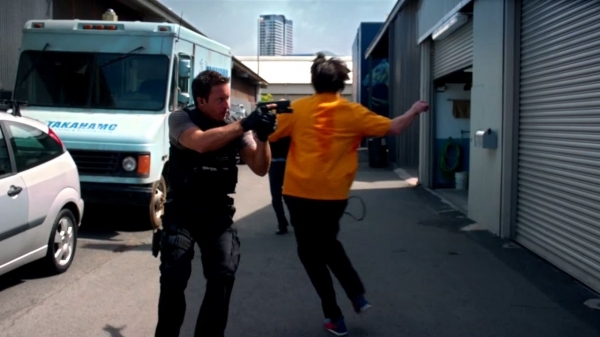 The next scene is an example of H50 comedy at its best. Toast is all kitted out in his undercover gear. Danny’s barely keeping it together as Toast explains to the boys that he has ‘glandular issues’ which are a problem in stressful situations. Danny tells Toast that the listening device is ‘gland proof’. Love it! But McG’s such a topper – he sees Danny’s ‘gland proof’ line and raises him a ‘live long and perspire’. Good one, McG! Poor Toast, he’s not at all keen on this operation. He takes his problematic glands into the Hacker Sweatshop and manages to get an audience with Liang. On the way in, he asks Danny about Plan B but Danny informs him that there isn’t one. There’s barely a Plan A let alone a Plan B! Hilarious. Toast’s glands really do prove to be problematic and he can’t finish his mission. 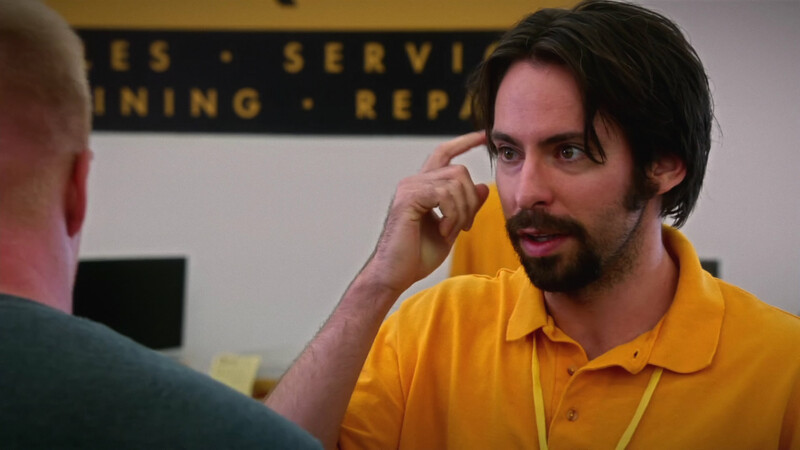 So this guest appearance is really just about adding some humour to the episode but Martin Starr, who plays Toast, did a brilliant job with the character. His lines were delivered with excellent comedic timing and he worked really well with Alex and Scott to stamp out his character which I could easily see being used again when some serious hacking skills are required – and just for the fun of it! Let’s hope we get to see more of Toast in the future, problematic glands and all. I LOVE Toast!!! I’m still laughing my arse off at him running out of that warehouse!!! 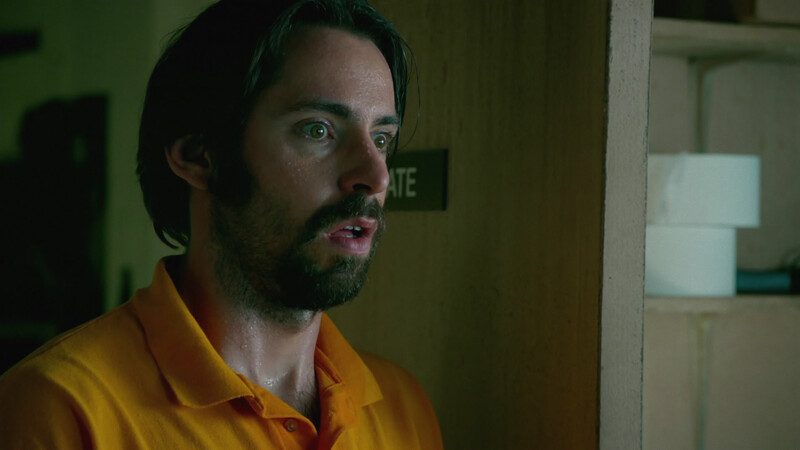 Martin Starr plays that character so brilliantly!! Makes me wonder what he’s like in RL! Hehe. The Plan B comment was a classic. I heard also that this was an adlibbed line that they kept, 😀 Toast is great value, do hope he comes back. If it was ad-libbed I love it EVEN MORE!! Agree totally, Paula. Show mostly does comedy really well and Toast is a great example of it. He could easily be brought back and worked into the COTW so I hope we see more of him for sure. He could start dating Mary! Imagine the aneurysm face! Toast and Mary as a couple would be AWESOME!!!! OH YEAH hold that thought girls. Toast and Steve’s baby sister could really make “Jam” together !!! Love Toast! It’s funny to think that he’s only been in two episodes since he seems like he’s been around a lot more. Way to go Martin Starr. In an unrelated comment, thanks for the new gun show images in the header. He can frown and cross his arms at me anytime. Agree on both counts – Toast and McG with arms crossed and frowning. Sigh…. WHAT SHE SAID!! Toast Rules!!! Thanks for stopping by, buttercup. 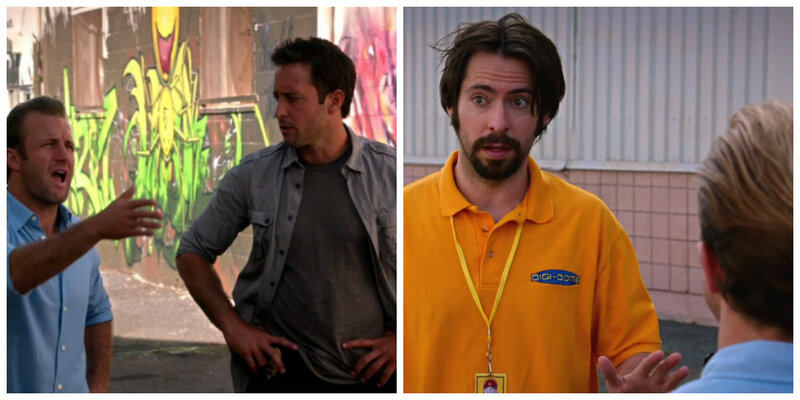 Yes, pic 6 was a good one – Danny arm waving and McG with his hands on his hips. Winning! Poor Westy, having to wade through pics of McG. Lordy, that man looks awesome with his arms crossed like that. I think I need a LLD now. Glad you like the new site header, ladies. Having to look at all the pics and try and choose them was just horrible. Horrible!I hate looking at pics of McG. The things I do for you all…. Yeah yeah Westy !!! We know. Poor Baby . HEH!!!!! The border is awesome!! So sleek it looks great! !